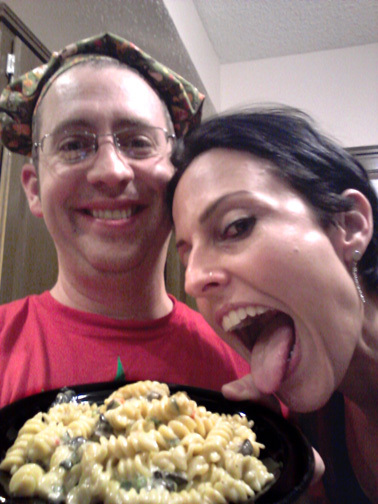 Mind-Boggling Life-Altering Earth-Shattering Mac and Cheese | Have YOU Ben Starr Struck? It’s everyone’s favorite food. And I confess, I even get excited about eating a fake-orange bowl of the artificial stuff from the box or at a restaurant. Who doesn’t like macaroni and cheese? BenStarr to the rescue! What you’re about to read is more of a framework method, rather than a recipe, and with it you can churn out an infinite variety of mac and cheeses, from simple sides, to phantasmagoric main-dish offerings, chock full of meat and vegetables. And you have an entire planet’s worth of cheeses to pick from. What’s more, it’s embarrassingly simple when you ditch the idea of the bechamel and just melt your cheese directly into hot (but not scalding!) heavy cream. You’ve got 2 categories of cheese here. Your base cheese should be a cheaper cheese that melts easily. Great options are Monterrey Jack (or pepper jack), fontina, low moisture mozzarella (the kind that comes in a block, not fresh mozz), commercial cheddar, and queso quesadilla. You can combine them to total 1 pound. I normally use 8oz sharp cheddar and 8oz Monterrey Jack. Your flavoring cheeses are more expensive, because they are made in small batches and aged, and so much more flavorful…so you don’t need as much. Superb options are Gruyere, Raclette, Emmethaler, Asiago, Parmigiano-Reggiano, Romano, aged extra sharp cheddar, smoked cheeses, aged chevre, or aged brie. If you want a truly sublime, intense mac and cheese, also consider an additional 2 ounces of a bleu cheese, like Gorgonzola, Stilton, or Maytag. Because all these flavoring cheeses are intense, it’s a great idea to start out conservative, then add more as you taste the sauce. If you are making a basic side dish for kids, you can eliminate the flavoring cheeses altogether and just use the base cheeses. Grate all your cheese first to prepare it for the sauce. If you’re using a softer cheese, like fontina, put it in the freezer for half an hour to firm it up a bit. Totally soft cheese like brie, chevre, and bleu cheese just need to be crumbled or cut into cubes, they can’t be grated. Then set your cheeses on the counter to come to room temp. If it will take you more than 30 minutes to get your sauce ready to the point where you add the cheeses, though, keep them in your fridge until you reach that 30 minute window. If your kitchen is extra hot, only remove them 15 minutes before adding to the sauce, or some cheeses may “sweat” fat. I like to use rotini because the spirals pick up and hold the cheese, but macaroni is traditional. (They even make giant macaroni!) Any type of pasta is fine…try cheese tortellini for an even cheesier finished product! Make the pasta yourself to make it extra special. Regardless of what type of pasta you are using, cook it in lots of salty water (it should taste like the ocean) for the minimum cooking time specified on the package. Then drain it, cover it, and keep it warm. If you’re doing lots of extras for your mac and cheese, you might wait to boil your pasta so that it doesn’t sit around for long before you add it to the sauce. I often add meat to my mac and cheese, usually bacon. If it’s a meat that is raw, like bacon or sausage, cook it first to render the fat. Get the meat good and crisp, then remove it from the pan, let it cool, and chop it up. If you are using an already-cooked meat, like ham, smoked brisked, pulled pork, leftover Thanksgiving turkey, or a cured meat like guanciale, copa, salami, etc…add 2-4 Tablespoons of butter to a pan (depending on how much meat you have), then saute your meat in the butter to crisp it up. Remove it to the side. If you are using duck breast, or any seafood like lobster, crawfish, shrimp, etc, don’t pre-cook the meat unless it’s raw. These meats overcook easily, and assuming you are starting with fully cooked meat, just fold it into the finished mac and cheese and let the meat warm gently from the hot cheese sauce. miscellaneous veggies…eggplant, sweet or hot peppers, roasted peppers, capers, artichoke hearts, tomatoes, mushrooms, truffles, fresh or dried herbs, etc. To the hot fat in the pan…(or if you are starting here without adding meat, add 2 Tablespoons butter to the pan)…add your aromatics. Like always, onions/leeks go in first for a slow saute, and when they begin to take on a little color, add the garlic, which cooks more quickly. If you’re using veggies like mushrooms, peppers, or eggplant, saute them first, then remove them from the pan before adding your aromatics. If you’re using softer veggies like tomatoes, artichoke hearts, roasted peppers, or fresh or dried herbs (thyme or sage are lovely), add them to the pan after the aromatics are cooked. Over medium high heat, bring the cream to a simmer, stirring constantly. Then turn off the heat and remove the pot to the countertop. Let it sit for 1 minute to cool a bit. Then very slowly sprinkle the cheese into the hot cream, a bit at a time, whisking very slowly but constantly. Don’t rush. You want the cheeses to melt slowly and evenly, and emulsify into the hot liquid…which results in that amazing creamy texture. If the cheese melts too quickly, or the temperature of the sauce gets above around 180F, you get that nasty grainy texture. An extra set of hands is nice for this step, so you can stir slowly and continuously as the cheese is sprinkled into the cream. If you use bleu cheese, which melts very slowly, you may need to add more heat. 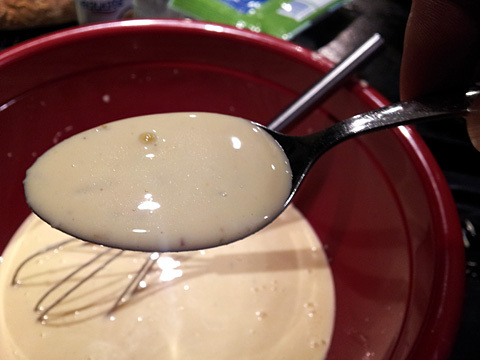 It’s better to transfer the sauce to a bowl and microwave it for 30 seconds, but you can return it to the burner, as long as you keep the heat very low, stir constantly, and don’t bring the sauce above 180F. 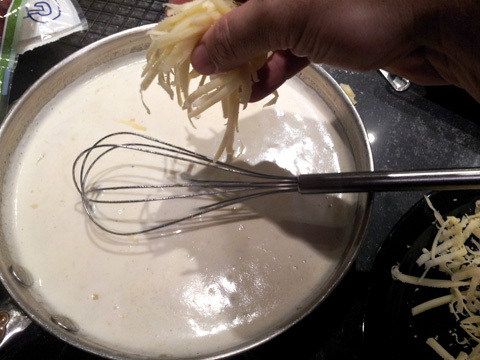 Once the cheese is fully melted, you may need to whisk the sauce a bit more vigorously to fully incorporate it. Taste it. You probably won’t need to add salt because of the salt content of the cheese, but you might. You may also want to add pepper…white pepper won’t leave black specks in your sauce, but isn’t as pungent as black pepper. Don’t worry if your sauce is a little thin. As it cools a bit, it will thicken up around the pasta once it is added. It’s better for the sauce to be too thin, than too thick. Immediately fold in your cooked pasta, along with the meat and anything else you wanna toss in at the end. Some people like to put bread crumbs on top of their mac and cheese and bake it. This can be dangerous…if any part of your sauce gets above 180F, it will start to separate and get grainy. So if you have to have bread crumbs, toss them in melted butter, salt, and garlic powder, and broil quickly until they are nicely browned. This is safer than baking. Your mac and cheese needs to be served IMMEDIATELY for the best texture. However, this isn’t always possible, and you may end up with leftovers that need to be reheated. In this case, use the microwave. Microwave in 30 second increments, stirring gently between each one, until your mac and cheese is just a bit warmer than warm. If you overheat it, it’s gonna get grainy! So now you’ve got the method. Go indulge in the madness! Get as crazy as you like with ingredients. Splurge on a really great cheese. Get creative with your leftovers. There’s no end to how versatile this dish can be! This entry was posted in Recipes, Side Dishes and tagged avoid, bacon, bechamel, cheese, cream, graininess, grainy, mac, macaroni, pasta, without. Bookmark the permalink. I made this for my parents Saturday, and it was the best I’ve ever had, let alone made. I can’t wait to make it again! I had this mac and cheese at a Frank a few month s ago and it was INSANE! I want to make it for Thanksgiving, but really need to figure out how to bake it, as cooking dishes on the stovetop is difficult when trying to get the rest of the Thanksgiving dinner ready. Plus, the quantity needed to feed 15 or so people would be difficult to to on the stove–I don’t think I have a pan big enough! I’m going to give it a trial run this weekend. Candace, baking will be challenging…if the internal temp gets much about 160F, the whole thing will curdle, so use a low baking temp and a long baking time! You couldn’t have picked a better title for your mac and cheese. I made this and it really was truly amazing! Thank you thank you thank you. Oh and my husband thanks you too! I used equal amounts of fontina, sharp cheddar, and jack cheeses for the base and then extra sharp white cheddar for the flavoring and added bacon. Yum! Sounds delicious, Ella! So glad you enjoyed the recipe! Best mac & cheese I’ve ever come up with is to add shredded sharp cheddar, philly whipped cream cheese, and kraft dried parmesan from the can. Each of the three types of cheeses blend and contrast with each other perfectly!